The plan for today was to visit Agen Allwedd. However due to the key not being available we had to make a late change to the destination. 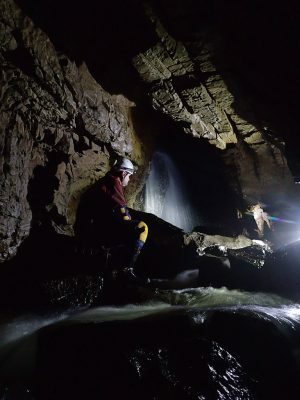 We decided to visit the Nedd Fechan Gorge. 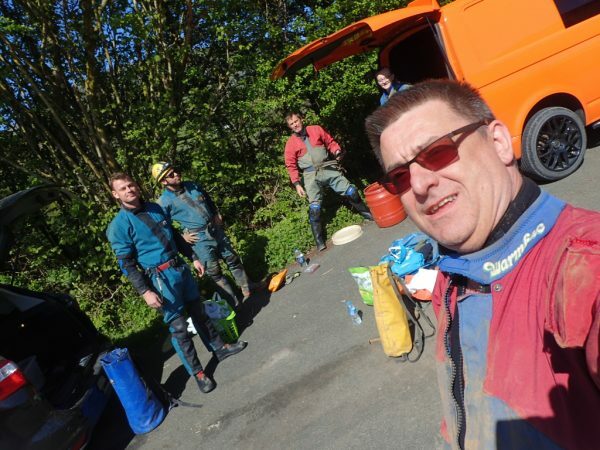 We met up at the respectable time of 10:30 at The Angel pub car park in Pontneddfechan. The laybys were already mostly full with day trippers to the four waterfalls walk, and if that was not enough, there was also a coach trip parked up in one of the laybys. Great for the local tourism to be so busy in March. Furthermore, the only public toilet in the village open at this time proving popular with a queue of about 10 people long, I decided therefore to cross my legs and not join the back of the queue of day trippers. We headed off up the hill in our vehicles and up onto the open land admiring some new born lambs at the side of the road, as the trees gave way to open moorland. Following the long no through road with the final part being on a steep left-hand bend with about a quarter of the road missing. 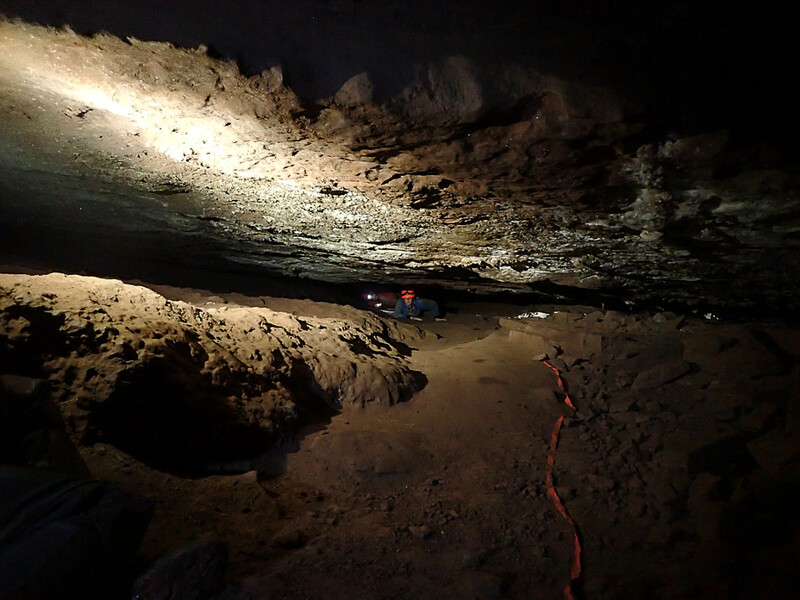 I edged my car gently around the corner and parked in the area just by Bridge Cave entrance. 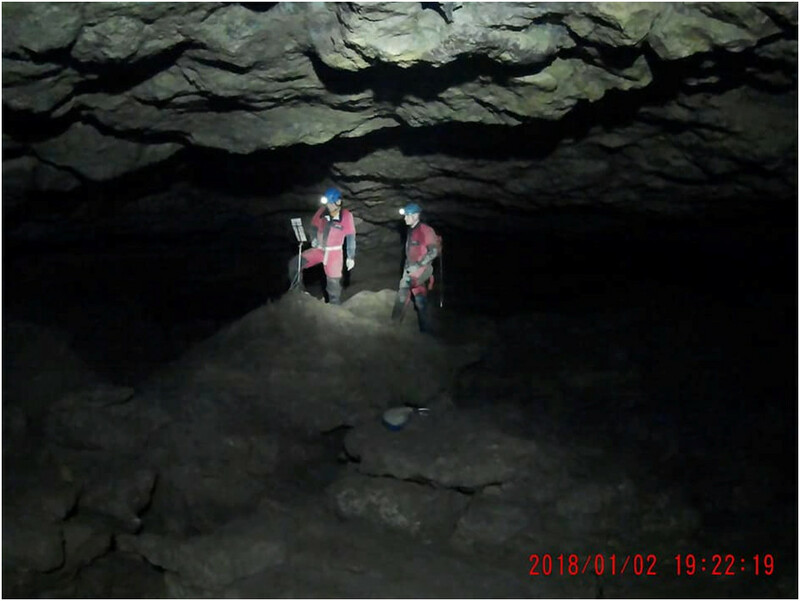 There were a couple of fellow cavers getting changed in the parking area. They were heading off for some diving. 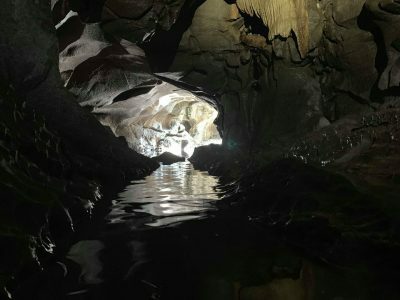 Adam and I were just there to have a mooch around the gorge and explore some of the variety of caves in this tight little cluster. 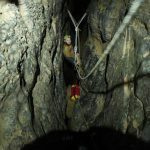 Our first objective was Bridge Cave. The entrance crawl had quite a strong smell of sheep. 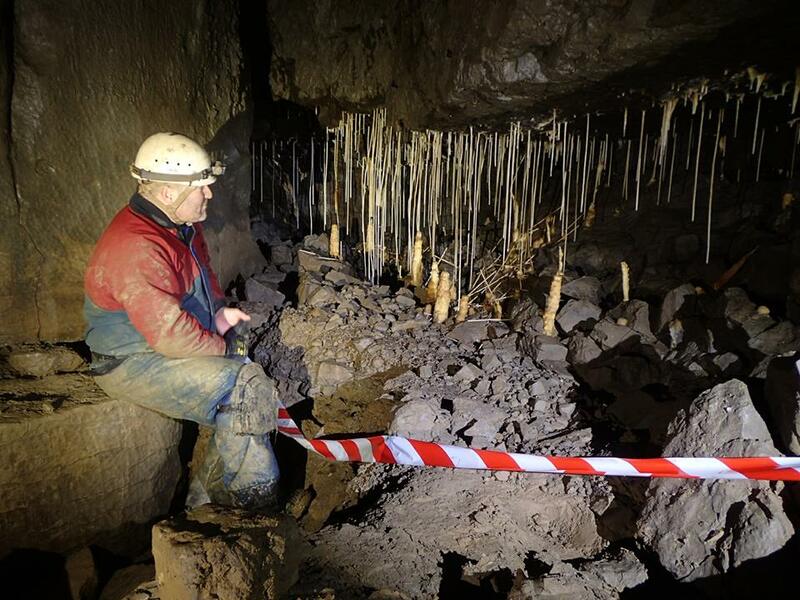 I assume that it was from the muck dotted around that had washed into the cave entrance. Putting the smell out of my mind, I continued crawling down the passage. 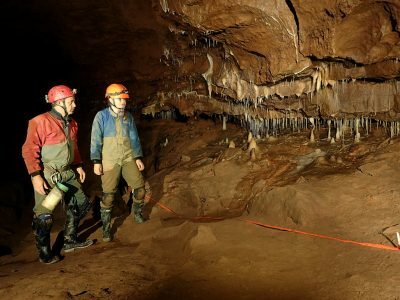 It is always nice to experience something new in a cave. For me it was the joy of crawling over large pebbles or maybe they were rounded rocks, I don’t really know when a pebble becomes a rounded stone and when that becomes a rounded rock. Not that any of this mattered to me as whatever their label, they had a habit of repelling my knees, hands and feet into the gaps. After a little more crawling along the downward pebbly slope, we came to the boulder choke. 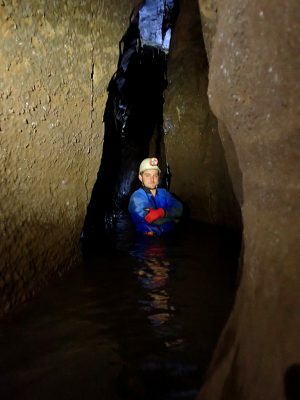 Threading through what to me was the cave’s most awkward bit. Heading towards the ever-increasing sound of the stream way, we dropped down into the water and followed the fast-flowing stream towards the main passage. 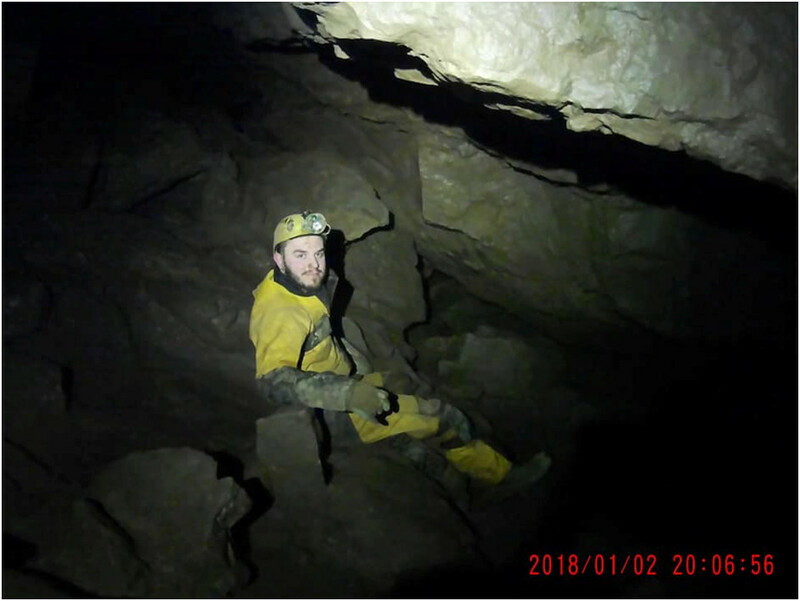 I was surprised at how large this passage was in this little cave. As we headed down to sump 1 at the end of the main passage. 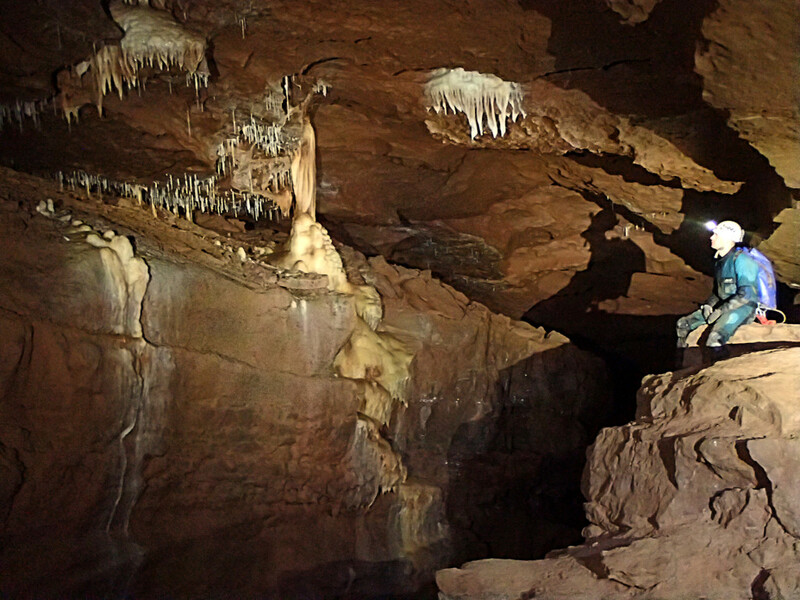 We passed some pretty flowstone and other formations. I am sure that these would have been even prettier at some point, as many were broken. There was however a good collection of pretty features. Walking back up to the main passage looking up at the bridge, which looked too straight and perfect to be natural. Viewed from underneath, the bridge looked like it was formed from steel joists. We climbed up the side wall and along the ledge to reach the bridge but chose not to attempt to walk on it. 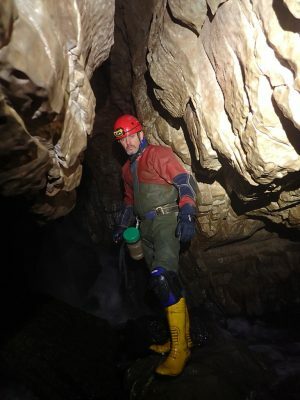 A quick mooch up a short crawl along a passage at this upper level. Some nice pools up here to see. 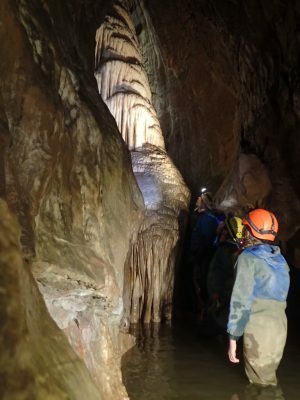 We climbed down and gradually made our way up, checking to see if the waterfall was flowing before leaving the main passage, it wasn’t. The boulder choke on the way out showing the somewhat dodgy looking piece of wood that seemed to be propping it up. Best not to dwell too much on the need for that bit of wood, or indeed for its remaining strength. Adam and then myself carefully and gingerly edged under the choke, feet first. We made our way out up the sloping crawl. 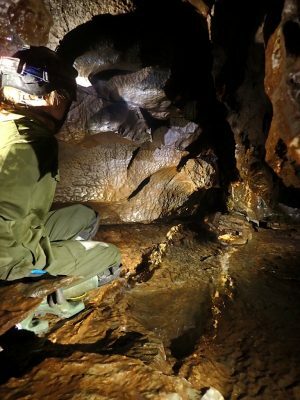 I was regretting putting my neoprene jacket on, finding myself uncomfortably hot in this cave. It was nice to get out for two reasons, to pass through and out of the entrance passage with its smell of sheep and more importantly, for me at least, to get out into the cooler air. We turned left, passing the sink, which was swallowing up what little water was left in the river by this point. Following the now dry river bed until we reached the top of the canyon or is it a gorge or is it a valley? Who knows? 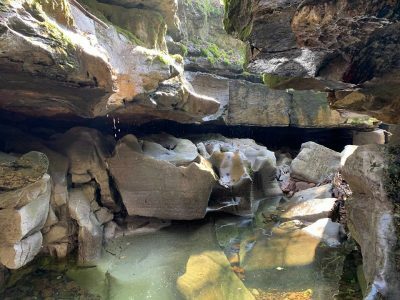 The pebbles on the river bed gave way to exposed rock and the top or the dry cascade into Cwm Pwyll y Rhyd. 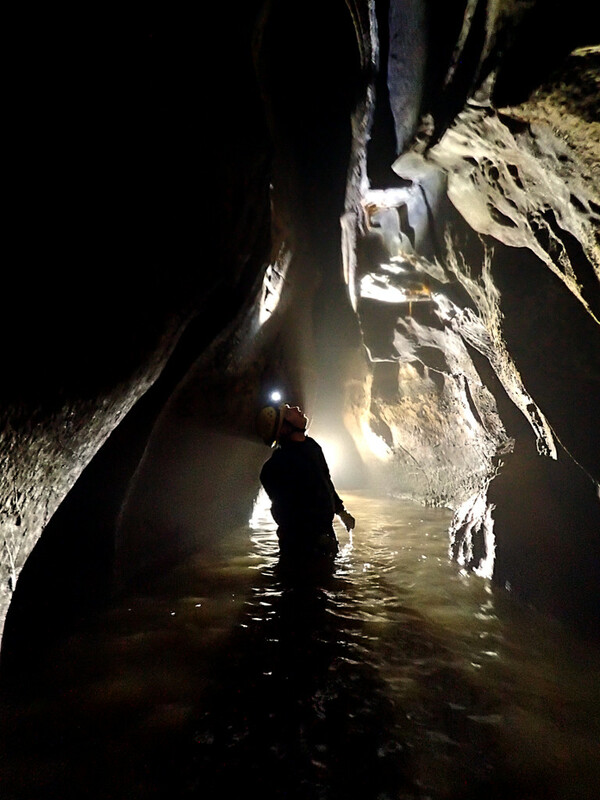 Here we climbed onto the shelf about a metre below, admiring the deep and incredibly clear pool about another 2 metres below us. 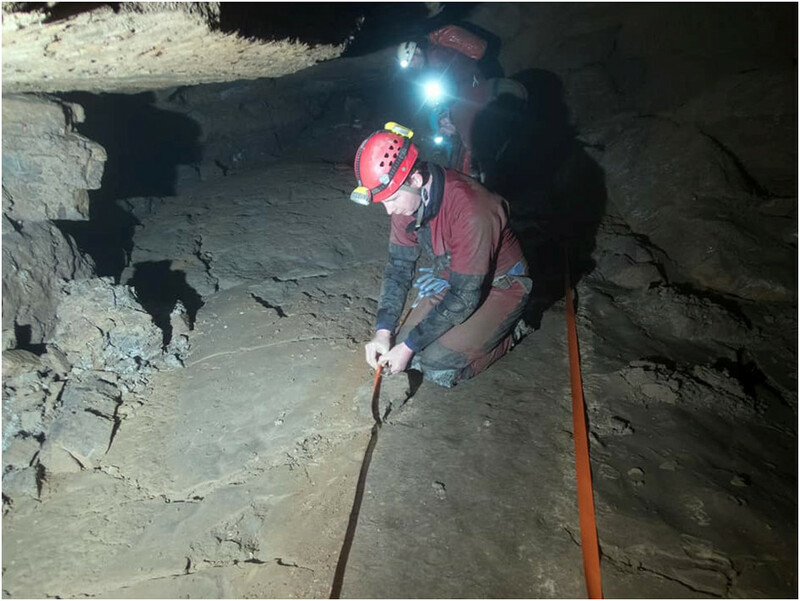 Finding the handline to the right-hand edge, we went down into the cave entrance. 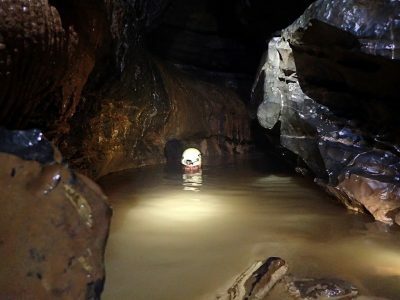 I did not wade too far into the deep pool, electing to keep my boots from getting wet inside, as we did not venture into the cave as the passages above the water level were behind many dead branches and other debris that had been driven in there under great force during a much wetter period. We exited again, by climbing up the dry waterfall, Adam taking the wet route through the pool, myself climbing up the handline as I was still keeping my boots dry inside. 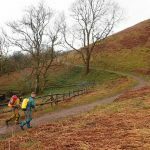 The way on was by means of retracing our steps slightly and passing up and over the ridge to the immediate left of Cwm Pwyll y Rhyd. Next on our list, down the gorge was White Lady Cave. This involved re-joining the dry stream and continuing down the gorge, climbing down some dry cascades, until the large entrance to White Lady Cave was met, on the right-hand side. All plans of remaining dry socked soon were thrown out as this cave involved a shall I just say bracing wade through the water, which was rather deep in places. 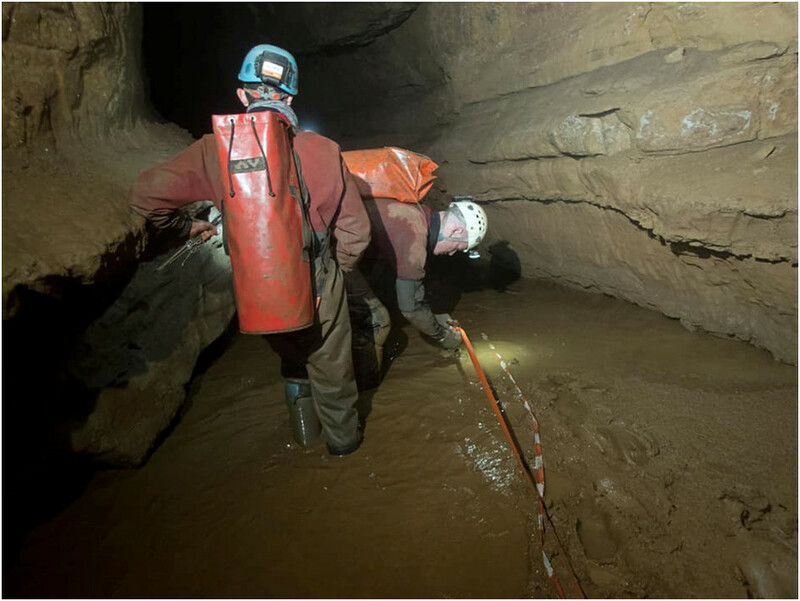 We pushed on through the water, crossing the cave a couple of times until we reached the sump marking the end of our journey into this cave. 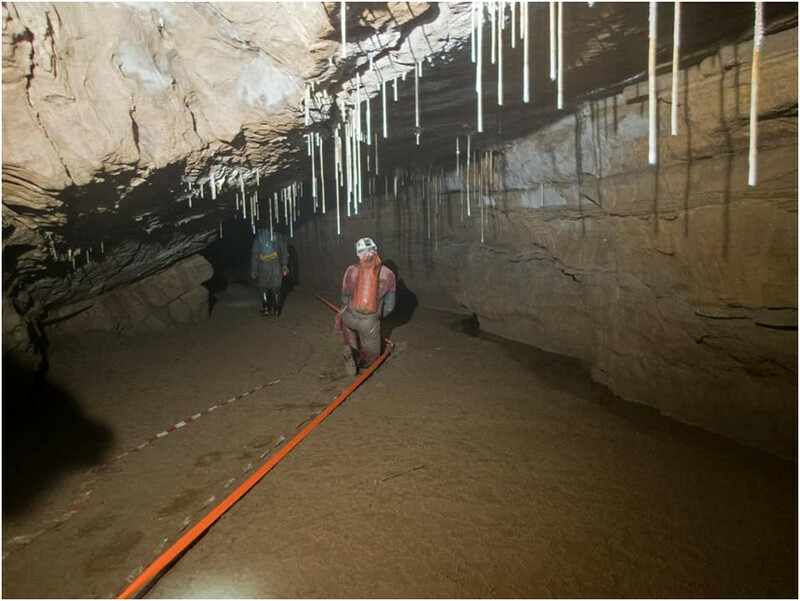 The walls of this cave had a distinctive light grey colour to them and had fine examples of scalloping. 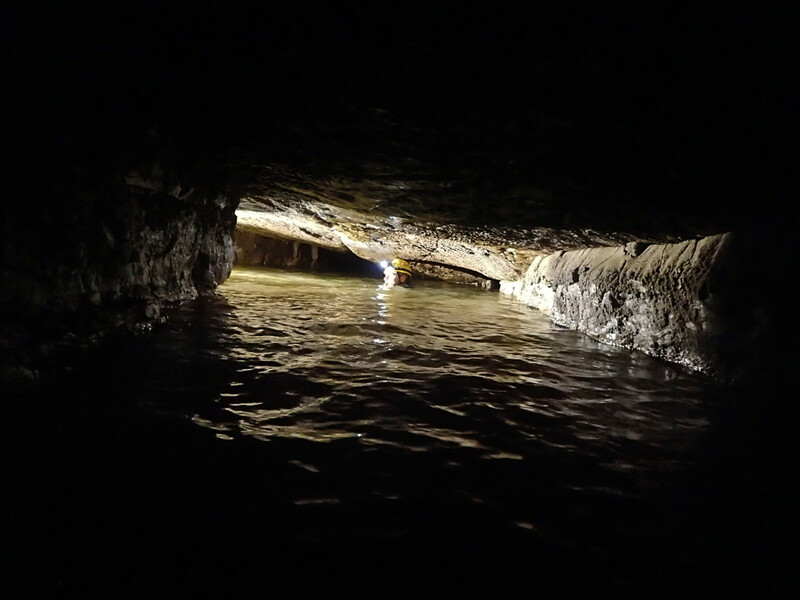 I resisted the strong temptation to swim out and followed the route that we took into the cave, but in reverse. The gorge continued downhill to the right. 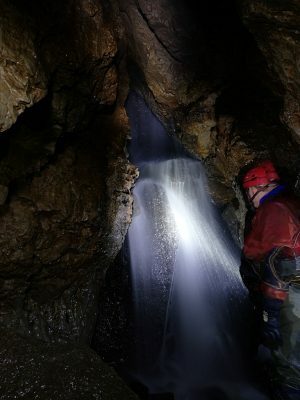 We crossed many fine gour pools and some lovely yet slippery features. It was here that my brain became slightly muddled up. Had I been in hiking gear, I would have been a great deal more careful footed and been very conscious of the incredibly slippery algae covered rocks. 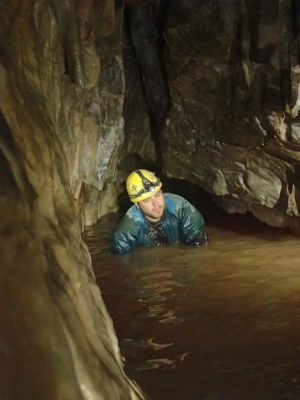 However due to my body being encased in a caving over suit and my now wet feet being in my caving wellies, my brain overruled my feet. 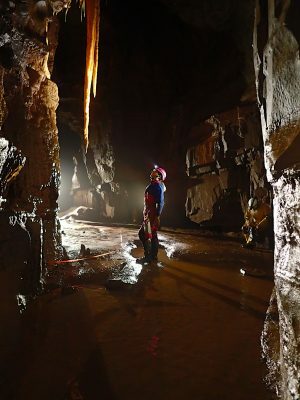 I was so used to walking in caves in this clobber that I forgot about slippery rocks, and before I could say green slime, my legs slipped from under me, losing their grip and my backside was heading straight down for a hard collision with the rock beneath it. Natural reflex reaction kicked in and my hands went out behind me to break the fall. I had avoided a bruised coccyx, but sacrificed my wrist and shoulder, jarring both, leading to the aching pain that I am still experiencing in my wrist as I type this log some 30 hours later. A few more climb downs led us to the entrance of Town Drain on the left had side of the Gorge. 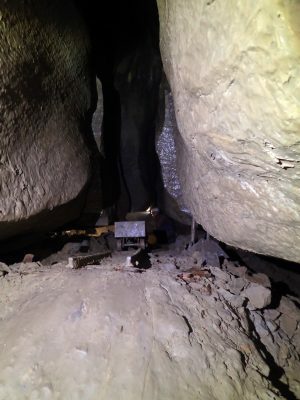 There was a low fence a couple of metres away from the entrance which was there to prevent debris from being washed into the cave at time of flood. 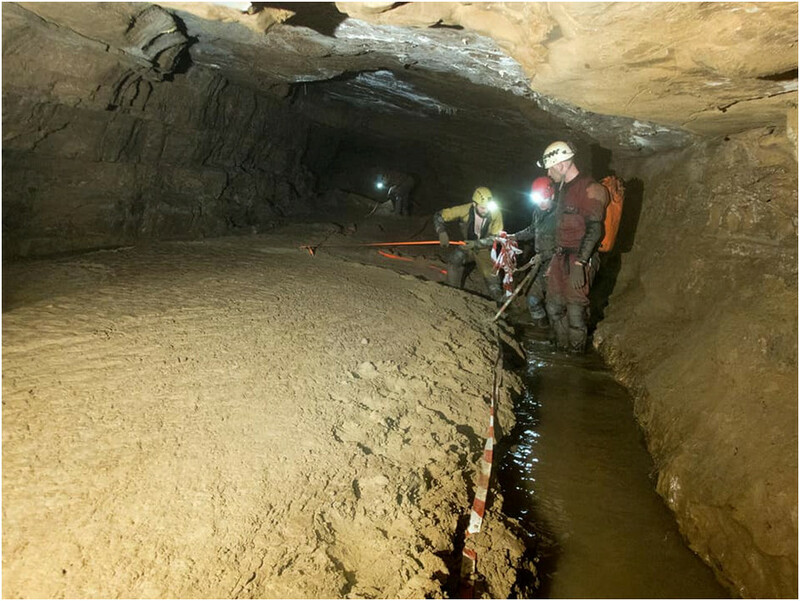 Also present were many bright white sand bags full of rocks from a dig within the Town Drain cave. 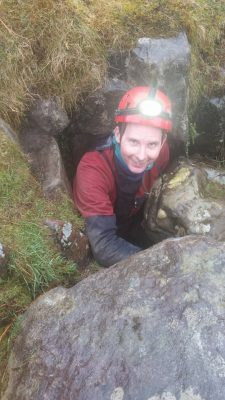 Ah another hands and knees crawl into another Nedd Fechan cave. I can see why the name was given, at least I think that I know why the name was given. 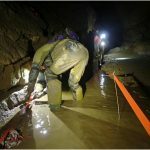 The cave was like crawling and walking in a drain. 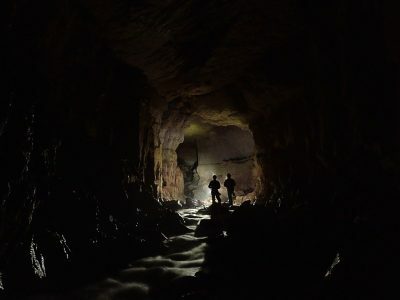 After a short while it opened out enabling us to stand up and pass through a couple of squeezes in the rift, with water up to our knees before the cave tightened up to a hands and knees crawl again. It continued though a couple of right angle turns then seems to drop down a tighter muddier tube. 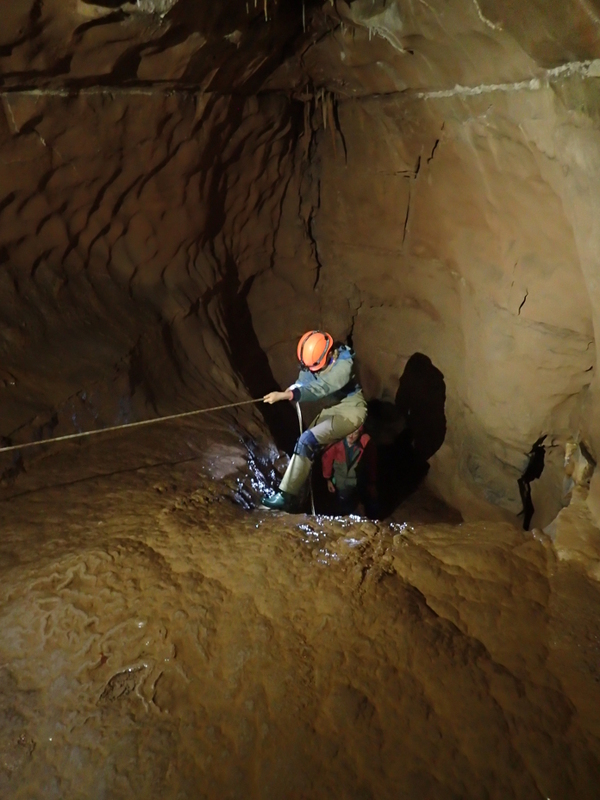 We decided not to descend further and turned around rather than dropping into the muddier parts of the cave. 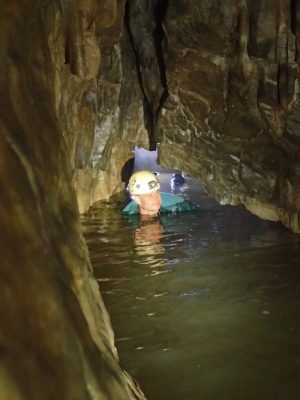 Chat on the way out of Town Drain was centred on how scary and dangerous this cave could be after heavy rain and that it would be a frightening place to be if it were to flood. 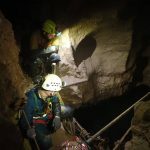 After exiting Town Drain, we turned back up the gorge and did some more dry canyoning by means of the same route that we had taken on the way down. We walked straight past the cars in order for Adam to show me the entrance to Little River Neath Cave. About 5 minutes upstream from the parking area a man-made dam can be seen on the opposite side of the river, beneath a small rock outcrop. This was the entrance that we were looking for. Taking it in turns to get on our bellies and look down into the entrance crawl. 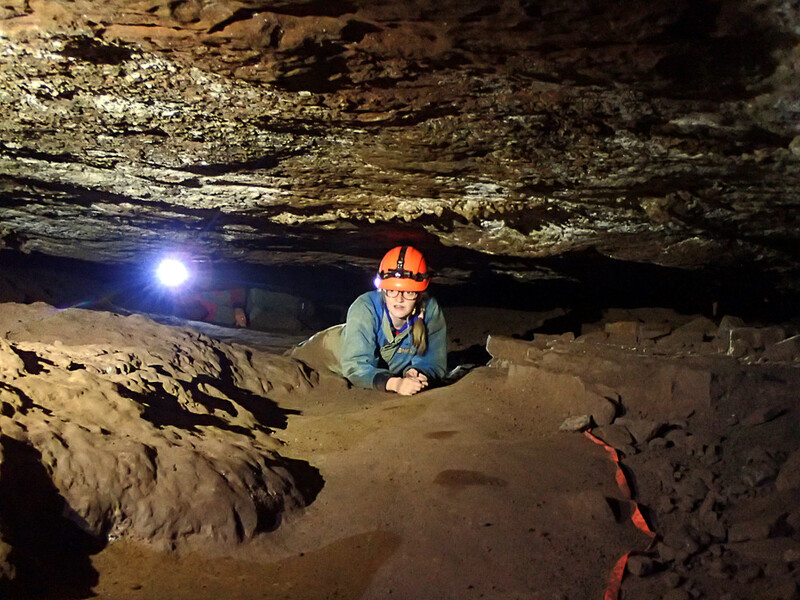 I look forward to doing a trip into this cave soon. 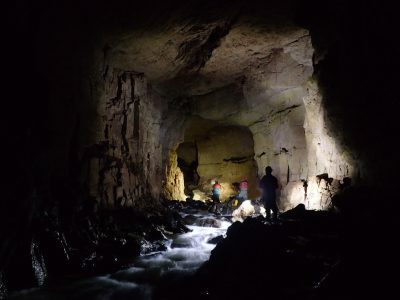 But that would have to wait for another day as we had not planned, nor prepared to enter this cave, so we did not venture beyond a look in from the river. There were a couple of families camping in the field on the bend of the river. A lovely spot for camping, I am sure. It seemed a shame to be getting in my car and heading home, rather than enjoying a night under canvas in such an idyllic spot. Back to the cars to change, chat and drink a warming cup of tea before heading home. Initially I was disappointed about not being able to visit Aggy, a cave that I have not been to yet. It would have been a great walk in and out to the entrance in this fine weather too. But sometimes things happen for the best. We decided to go on a different trip and I must say that I thoroughly enjoyed my time. It was a good few hours spent in great company. 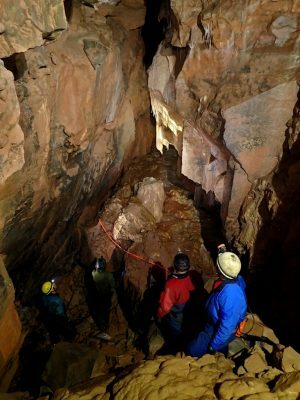 It had a child like sense of exploring this hidden gem in the southern Brecons. 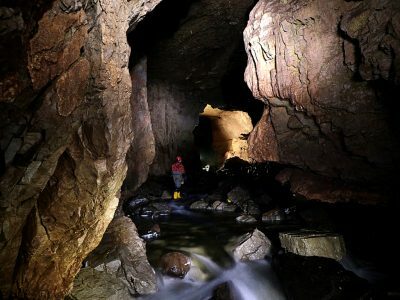 I know that I will be returning here to enjoy the delights of Nedd Fechan Gorge, both above and underground it really is a place of beauty and tranquillity. Sunday morning and we met up and travelled in groups from our various houses in Wales. 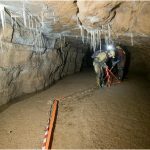 Our plan was to meet at South Wales Caving Club HQ and confirm the routes according to the actual attendees on the morning. 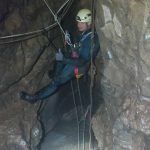 I had the opportunity to join the round trip, but as a novice, albeit apparently with good beginner confidence, stamina and technique I opted to improve my technique and confidence a little more with a more straightforward trip. 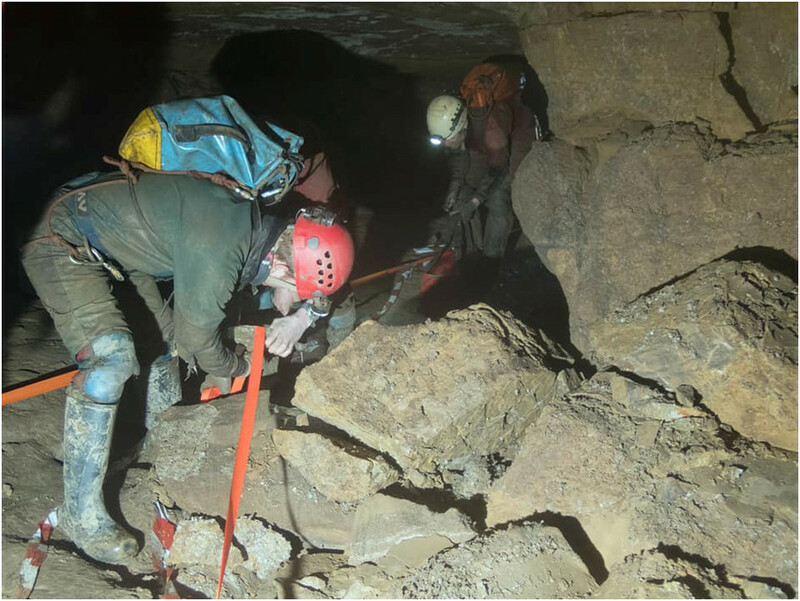 I was anxious that had I lost my confidence in my ability during an exposed traverse, it would put my colleagues in a difficult situation. I therefore chose to cave with with group 2, heading to salubrious passage and swamp creek. 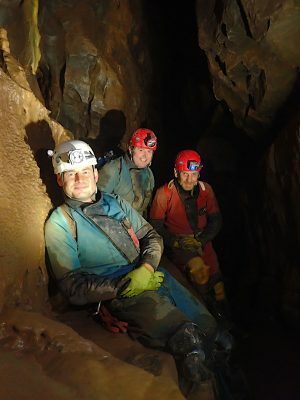 We had two prospective members with us, Mark and Rhydian. 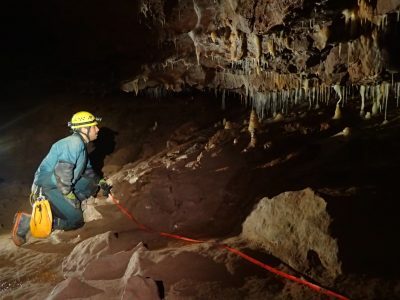 Always nice to welcome new potential cavers. We registered our trips, collected the keys and after changing, headed up towards the entrance. One benefit of the very strong wind that was signalling the arrival of Storm Gareth was that it was a tail wind. A quick stop to allow Rhydian to sort out his wellington boots, which would not fit over his under suit and socks. He sorted this wardrobe malfunction out, taking about 4 attempts with various options until he found the right combination for his wellies to sit tidily. One thick pair of under socks removed and threaded around his belt and we stopped for a quick group selfie before splitting up and heading off on our own separate routes. 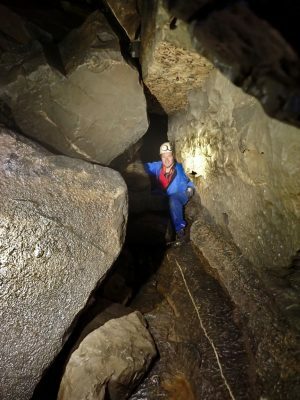 Our group headed off towards Big Chamber Near The Entrance then and then made our way over very slippery boulders to The Brickyard. Barry helpfully reminding me to remember to look back every now and again, particularly at junctions to improve my route-finding skills. Helpful reminders and I did see the route out with more familiarity than the blind ignorance I have possibly had on my previous trips. We walked through Gnome Passage. And yes, in my mind, those gnomes did seem to have their own personality. A brief look at the wedding cake, which maybe has melted sometime before my visit. Adam then asked if we wanted to see the Ribcracker Pinnacle, this was at the near end of Edwards Shortcut and is where a club member had a rib-cracking moment whilst going over the top. Back up to the junction at the top of Gnome Passage. At the junction at the top of the corkscrew, we met a group on their way out. This provided a good opportunity to stop for a short rest and a chat, whilst we waiting for the departing group to clear through. A careful descent into the top of The Corkscrew. I was a little too careful, As I did not notice which way Adam went through. I could see a more direct slot through, but was not sure whether I would fit through it. 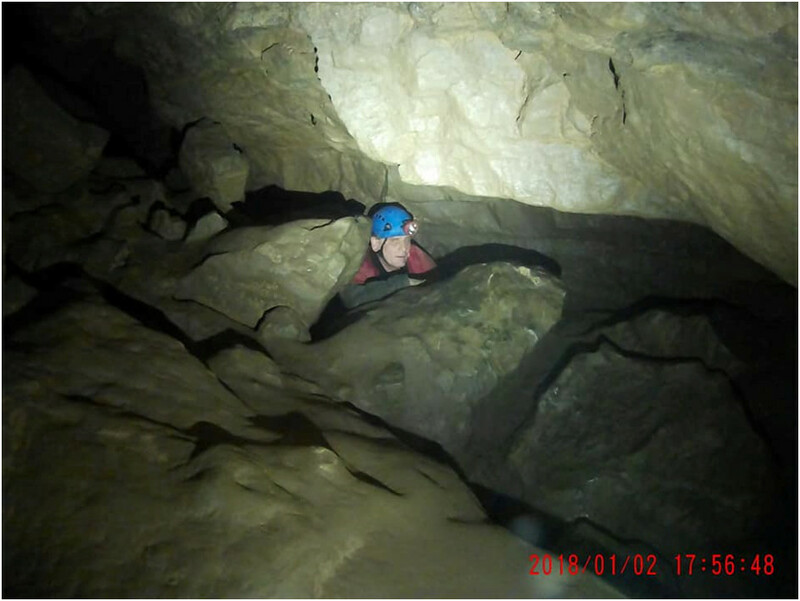 Fortunately, Adam was on the other side to provide guidance on the route down, ah so it is the right-hand side threading around the boulder at the top of the large staggered drop. Well that focused the mind. 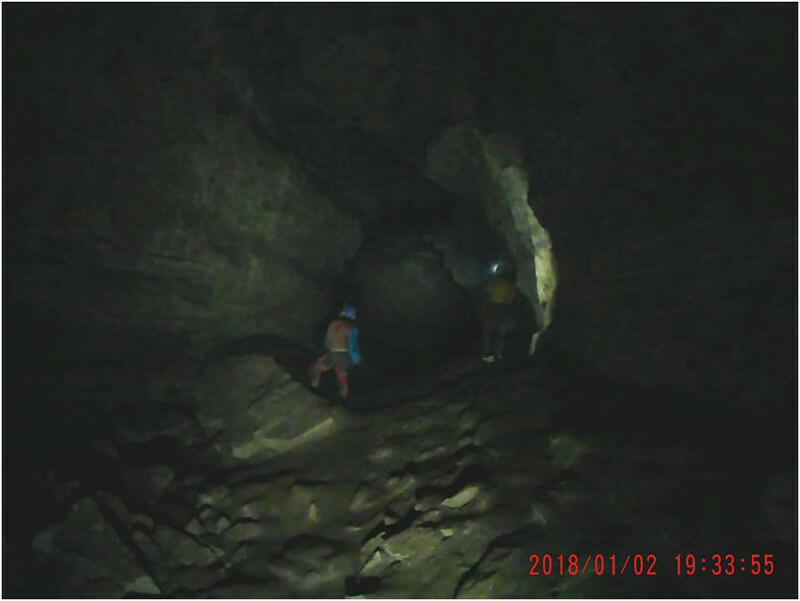 Then we pressed on, passing the 3 Brynmawr Caving Club members from Group one, on their round-trip in the passage before the crossing of swamp creek and over to the top of the nave. 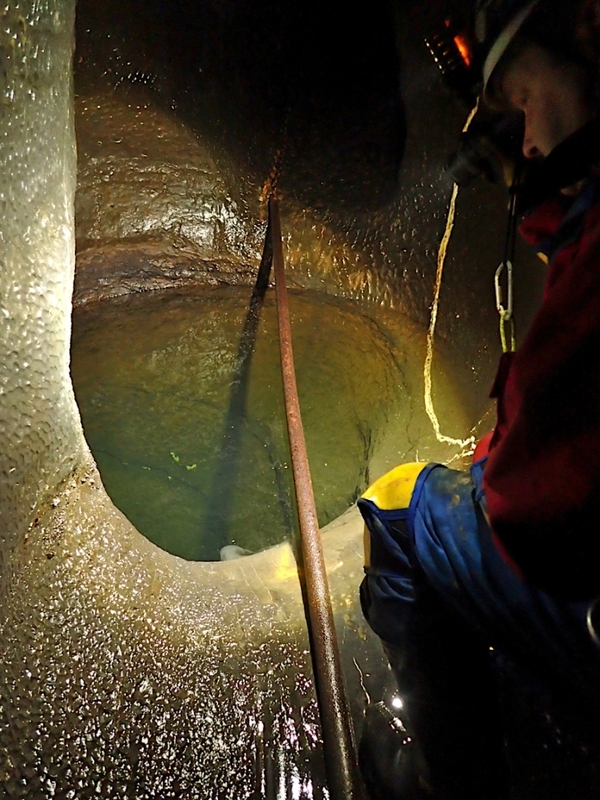 Looking down into what seemed to be a bottomless pit. Back to the crossing of the stream and we climbed down and turned right to go into Swamp Creek. After a couple of bends, I could hear the distinctive sound of a deep-water alarm. The unmistakable sound of male voices going up an octave or two when the water reaches a certain height up their body. The reward around the corner was a very beautiful formation above and to the right. It was now 14:30 and time to turn around and make our way out in order to get back to the cottages in good time. 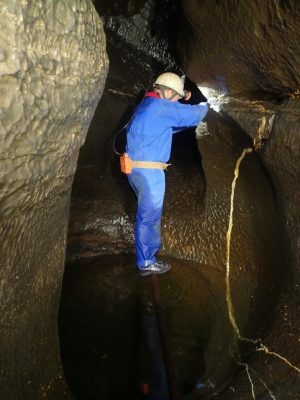 Upon leaving the water for the last time, a quick snack and a chance for all to relieve themselves of the additional weight of water in their wellington boots, before climbing up into the corkscrew. The double back on the climb up adding a little more of a challenge to what I found to be an enjoyable scramble up. This also ensured that any chill from the water was soon driven away from within. 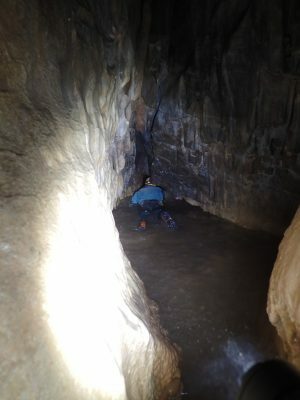 Some of the climbs over the boulders around the area of the brickyard were made rather tricky due to the rather slippery nature of the surfaces. The shower entering the chamber near the entrance being a great opportunity to add a little extra to some final photos inside the cave before crawling out of the entrance. Out of the entrance into the icy blast of strong damp wind making the arrival of Storm Gareth. We headed down to the headquarters without hanging around as there was heavy rain visible on the other side of the valley and it was heading our way. The sleet starting just as we entered the cottages to get changed, signing out and heading down to the Ancient Briton for a warming drink before heading off on our differing routes home. 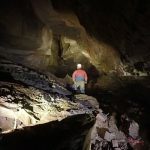 James had shown himself to be more than capable with his first trips and so Gareth and I decided to show him something different with a trip into North West Inlet in Craig a Ffynnon. We arrived at the layby and quickly changed, as the midges were out in force and caver was definitely a favoured treat for them, and made our way to the entrance. 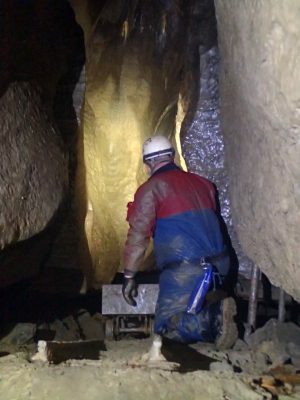 The lock gave some minor problems as the bar refused to come through the small hole it rests in but this was soon sorted and we were in. 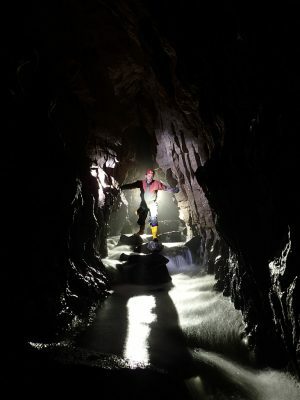 James entering Craig a Fynnon. We were soon scrambling through the entrance series and James was suitably impressed. 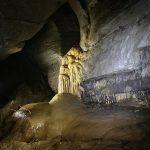 This was the first well decorated cave he’d visited and the formations that can be seen so soon after entering are had him in awe on several occasions. It’s easy to forget what these places are like when you first see them. 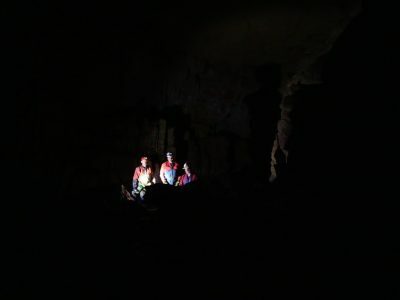 It is easy to become blasé and forget how special a lot of our caves are, it is only when you take someone who has not been exposed to what can be seen underground that you remember what it is that you are speeding past on your way to whatever objective you have for that trip. It is occasions like this that you get the opportunity to slow down and look around again and often it is with a renewed sense of wonder as you see things that you’ve missed before or re-see those things you always knew were there but for some reason have forgotten. Philosophical musings aside, we made our way leisurely through the entrance series, up the ladder at the First Choke. 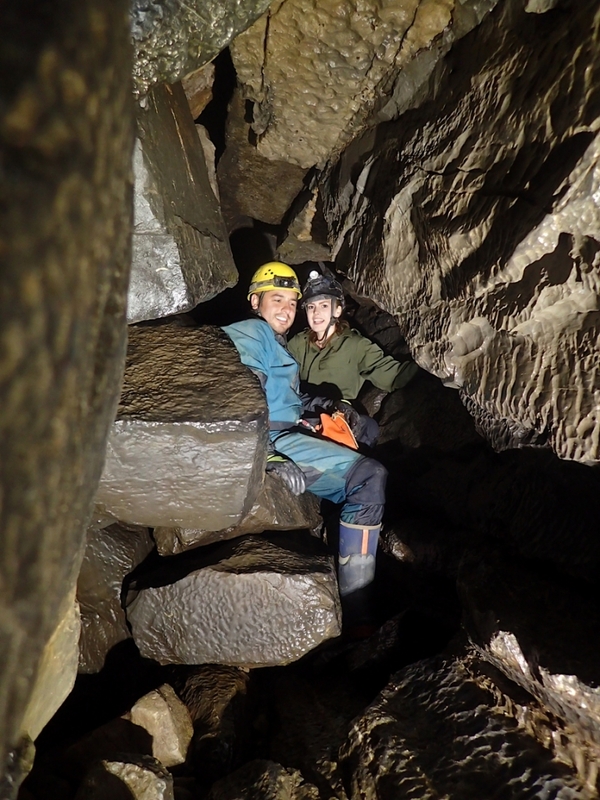 Here, in the first big chamber reached in the cave, James was keen to explore further so Gareth took him up the boulders to the further reaches of the chamber for a look. It was then into the crawl in Gasoline Alley. Water levels were very low after the the recent dry spell and the pool at the end was passed with hardly a shudder. 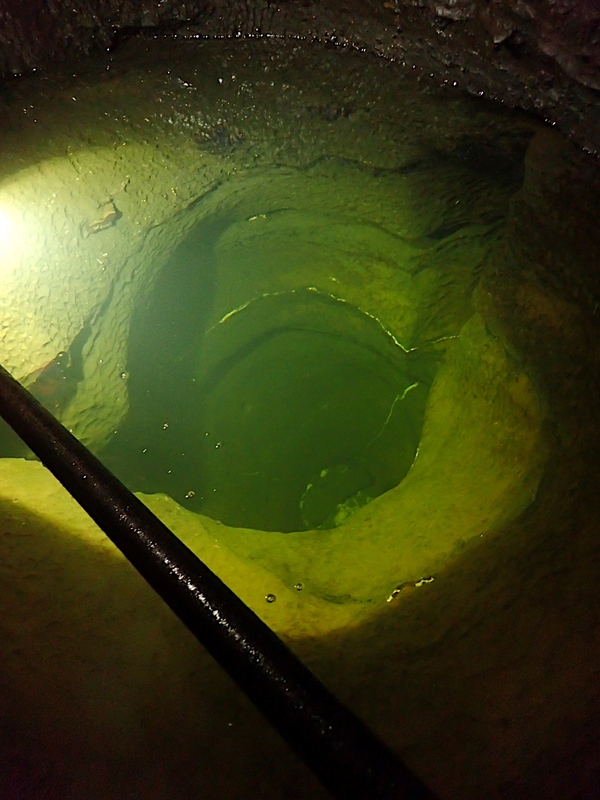 Arriving at the entrance to NWI, the clear water looked very inviting but we first nipped up to show James the small attractive sump pool and the way on further into the cave with a promise that he’d be heading that way soon. 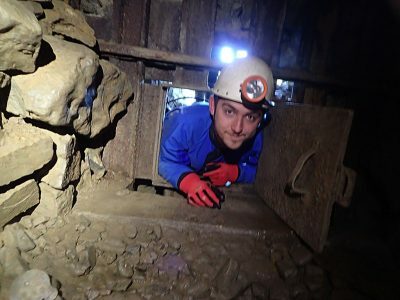 It was then back to the blasted tunnel and into NWI. The water was as cold as ever, in fact I’m not sure that it really gets any warmer. Perhaps the perceived temperature is a relative thing. 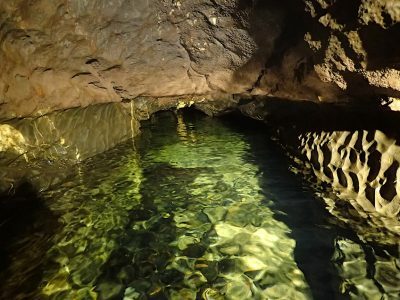 On a warm day, you will enter the cave already warmed up and will warm up more than usual if you enter on a cold day, and so, the water will feel colder than it really is. Whatever the temperature, I love this bit of passage. 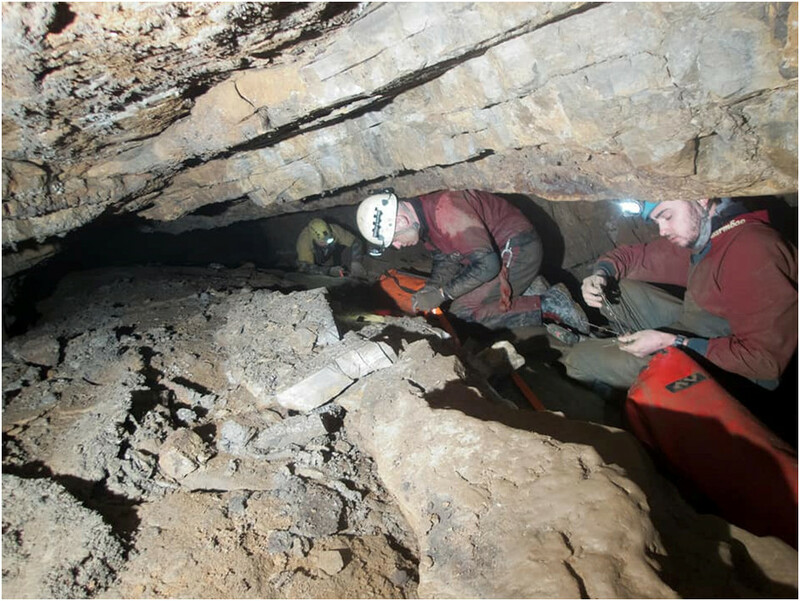 It always feels like this is more like the sort of caving that non-cavers think we experience all the time. Gareth was now enjoying himself even more and decided that the warm balmy waters were great for a swim so paddled up and down while I took a photo or two of James. All good things come to an end though and we were soon getting stuck in the short section of sticky mud. 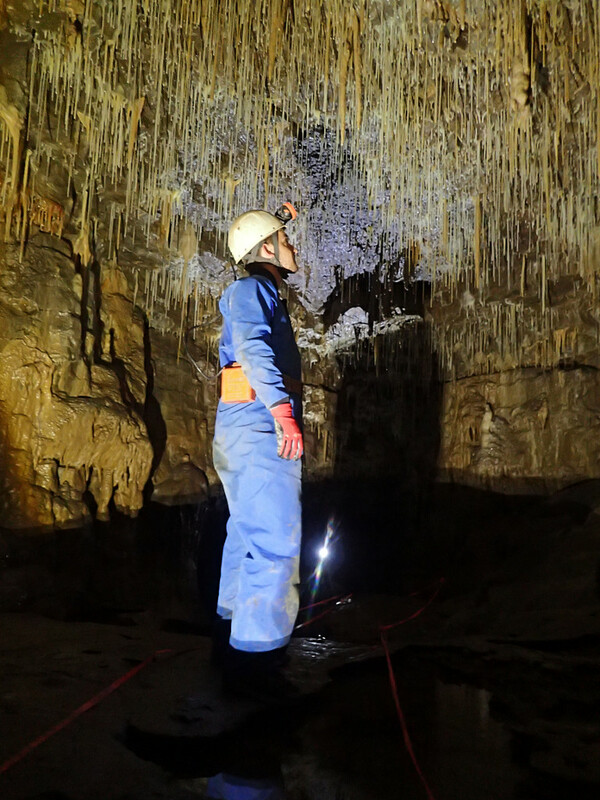 And then more wonderment from Gareth and James at the increasing passage dimensions and the formations. James had been asking (tongue in cheek) when we’d see the plastic dinosaurs so it was a great surprise when he clambered over the boulder to be confronted with the Dragon formation. This needed a photo. We’d soon seen all that NWI had to offer and, as we’d spent longer sightseeing than usual, we moved quite quickly back through the way we’d come and were soon back at the cars. Here the midges descended in great clouds on us, forcing us to change as quickly as possible, curtailing the usual chat about the trip. Gareth and Freya had not so far visited OFD and so a trip to do a roundtrip in OFD1 was planned as an introduction for them and the Sunday saw us meeting up nice and early to pick up a key and fill in our trip card before parking up in the layby to change and the short walk to the cave. 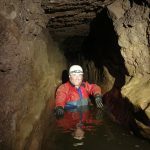 The plan was to do the classic round trip, up Main Streamway to Low’s Chain and Low’s Passage then the climb up to Roundabout Chamber and the Shale Crawl into the Rawl Series. 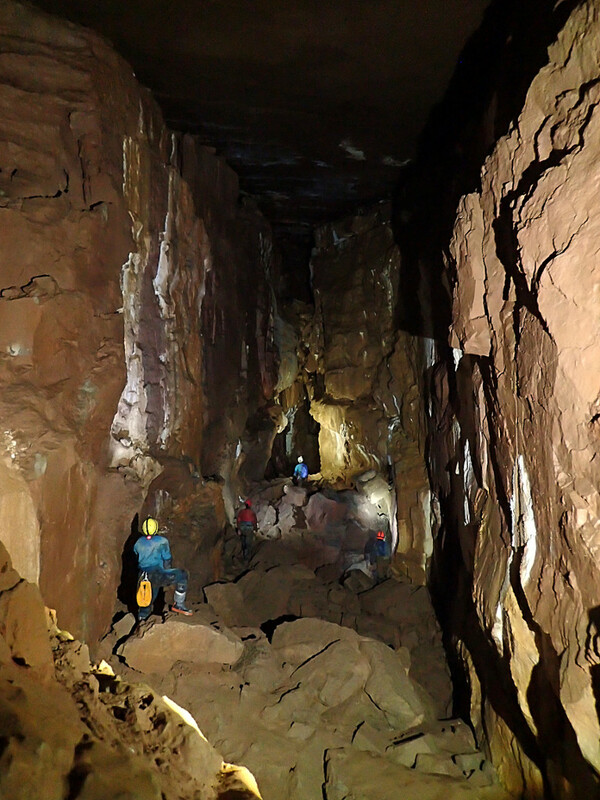 Then along to Pi Chamber and down via Bolt Passage to the Bolt Traverse. 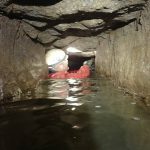 We decided against continuing to Airy Fairy or finishing the loop via the Dugout but to drop down back into the Main Streamway via the Maypole Chain. We were soon changed and ready to set off and a quick selfie was taken that show’s Gareth’s very basic mistake if you look close enough. We were then soon walking through brilliant sunshine up to the entrance. 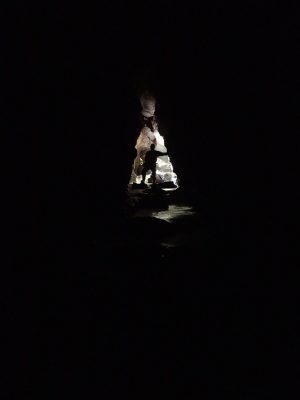 where we quickly sorted ourselves out and climbed down the ladder into the cave. 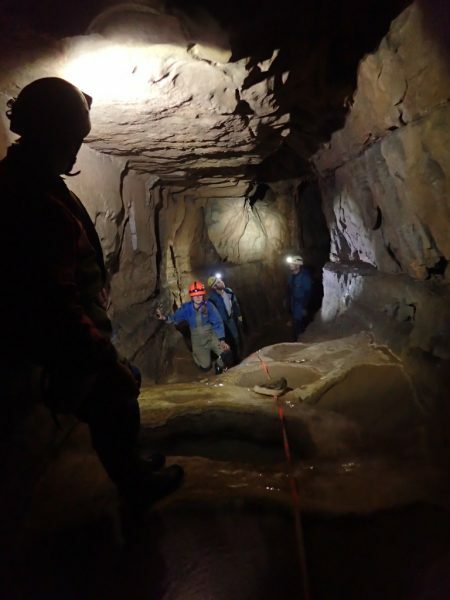 We headed off towards The Cathedral, pausing at the start of Pearl Passage for a quick tale about the skeleton in Skeleton Chamber and then along the trade route to the start of column passage. 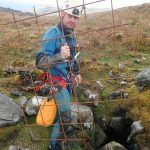 At Column Passage we pushed dave up the climb to rig a handline before we all followed him up. 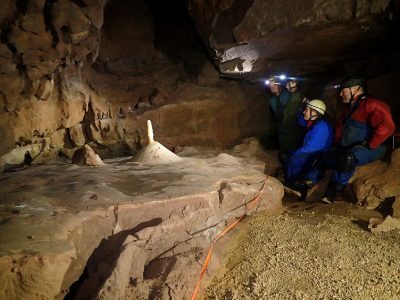 The column is a very impressive formation that I always like to see and Gareth and Freya were suitable awed. Dave and Gareth nipped through the duck to visit the Eagle’s Nest whilst we more sensible three stayed dry and took a couple of photos. 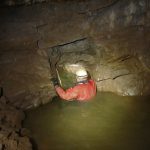 It was then back along Column Passage and back down the handline. Before climbing down at The Step and heading upstream. 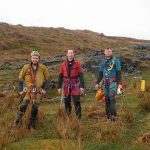 We passed Low’s Chain on the right and continued to Boulder Chamber to show Freya and Gareth the way on through the mountain and stopped for a pasty before heading back to Low’s Chain. Here, the awkward climb is now considerably easier as a short section of ladder has appeared. This made the climb up a breeze and we were all soon up and we headed off up the lofty Low’s Passage. 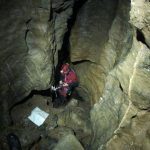 I explained as we went how the early explorers thought that they could see high level passages here and spent some time scaling the passage with maypoles only to be dissapointed as each lead turned out to be shadows or alcoves. 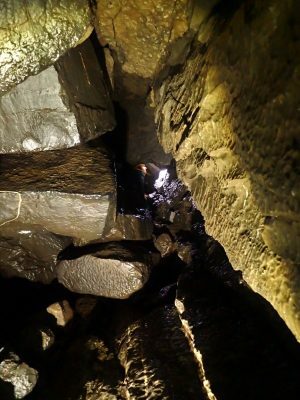 At the end, the passage closes down and you climb up through boulders until a choice of left or right is found. We had a quick look left to see what was there (more boulders) before continuing the steep climb up to reach Roundabout Chamber and it’s fine grotto, The Bee’s Knees. 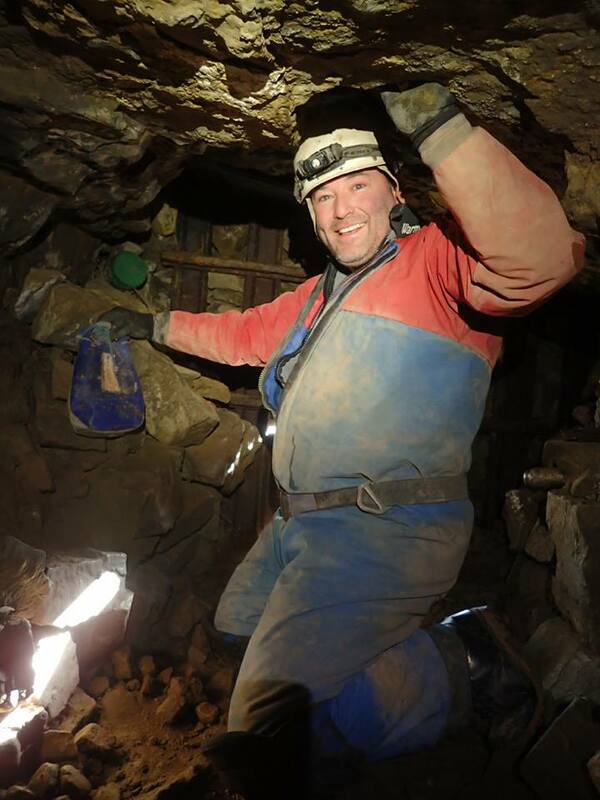 Some photos using some very overused poses were taken before heading off and then to the Shale Crawl. A short section of flat out crawling that soon opens up again. 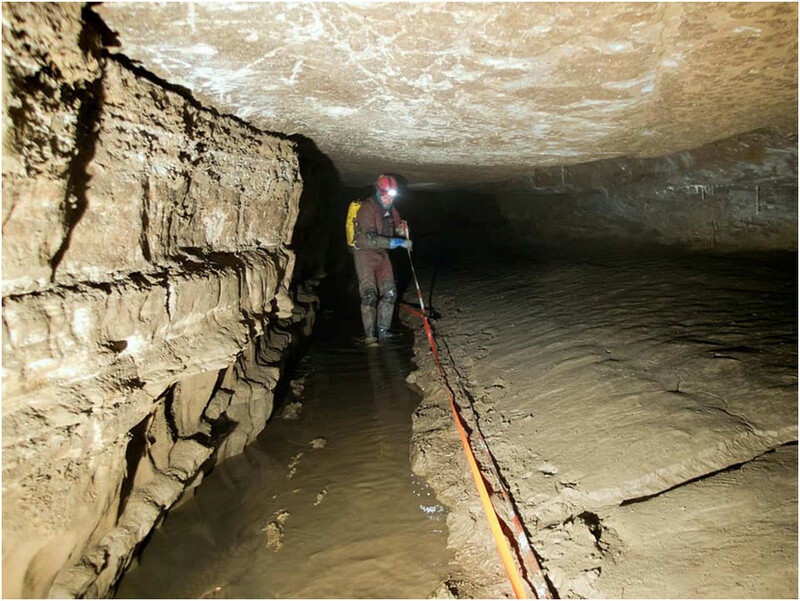 The passage now assumes very large proportions as you enter the Rawl Series. For me, one of the most imppressive passages in the OFD system with a few fine formations. 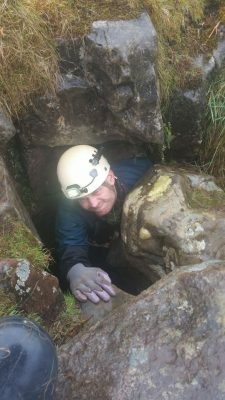 At the end of the Rawl Sereis, Pi Chamber is found and the entrance to Helter Skelter is found that leads via Boulder Passage and a fun little slide down a tube to the start of the Bolt Traverse. 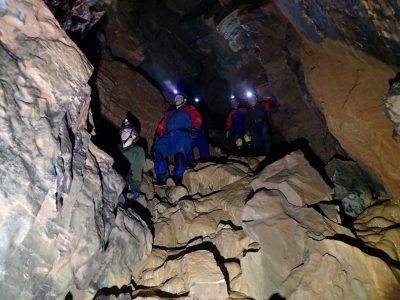 We were all quickly along the traverse and into the small passage at the end. 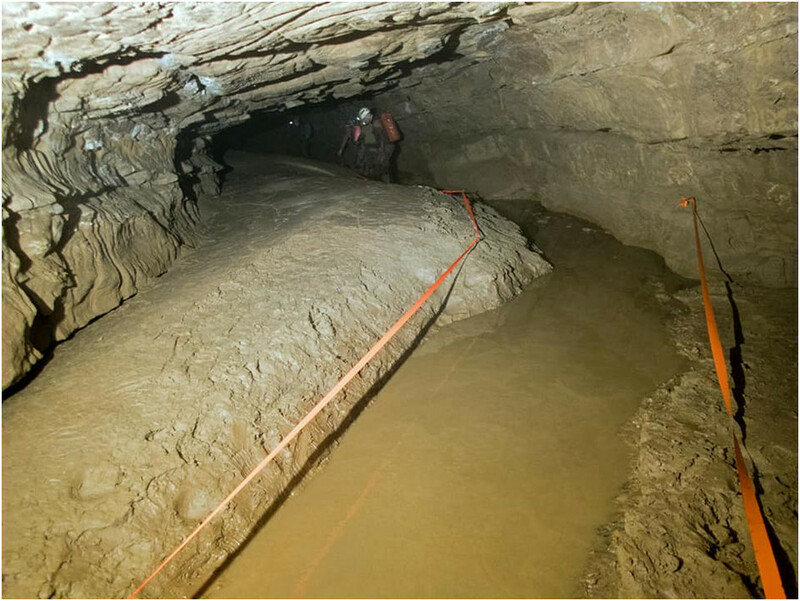 And then the short section to the Maypole Chain and back into the Main Streamway. We ambled back downstream, past The Step and a quick look into Loopways before getting back to the Toastrack via Pluto’s Bath. Here Gareth either forgot about the big hole in the floor of the pool that we showed him on the way in or some Gollum-like creature tried to drag him down to its watery lair. From here, we were soon back out in the sunshine. We’d taken longer than usual on this trip but we were taking our time and enjoying the sights as well as taking a few deviations to explore off the route. All in all a really good trip that we all enjoyed. After booking a Yorkshire trip for later in the year, we decided it would be a good idea to brush up on our SRT and what better place to do it than Pwll Dwfn? 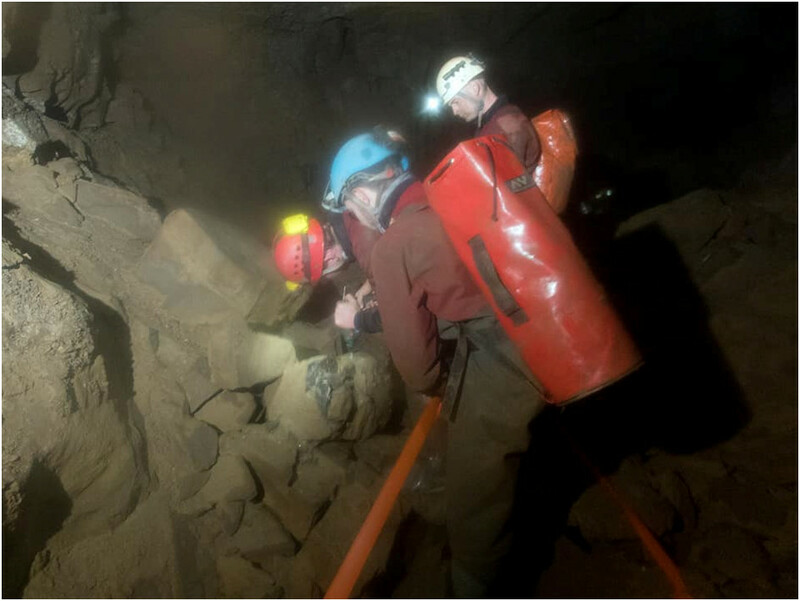 You can practice on indoor training walls all you like, but you aren’t SRT proficient until you have used your skills in a real world cave. The date was set – 7th April 2018. Morning broke with some heavy rain, and me thinking ‘Do I really want to trudge up the hill in this weather?’. 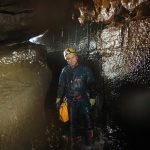 Despite frantic pleas to my caving colleagues for a Daren Cilau trip, Pwll Dwfn was still on the cards for the day, regardless of the weather. Meeting at the DYO car park, Huw and I had a quick coffee before Dave turned up around 1030. We were soon changed and on our way up the hill, stopping for the occasional photograph. We were soon at the cave entrance, and kitted up. One last photo before we wave goodbye to daylight for a few hours. Huw was down first, to rig the first pitch, Dave and I followed with the rest of the rope bags. 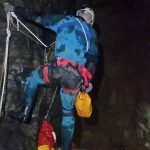 We found the cave already rigged with mostly 9mm static rope of a suspect vintage, we elected it would be best practice to shadow rig our own ropes alongside. The in-situ ropes were a nightmare when it came to rebelays and deviations, forever tangling around our fresh ropes. We had to be mindful we were clipping into the correct ropes at the various pitches and obstacles, although our nice clean ropes were easily contrasted against the muddy, worn, in-situ ropes. 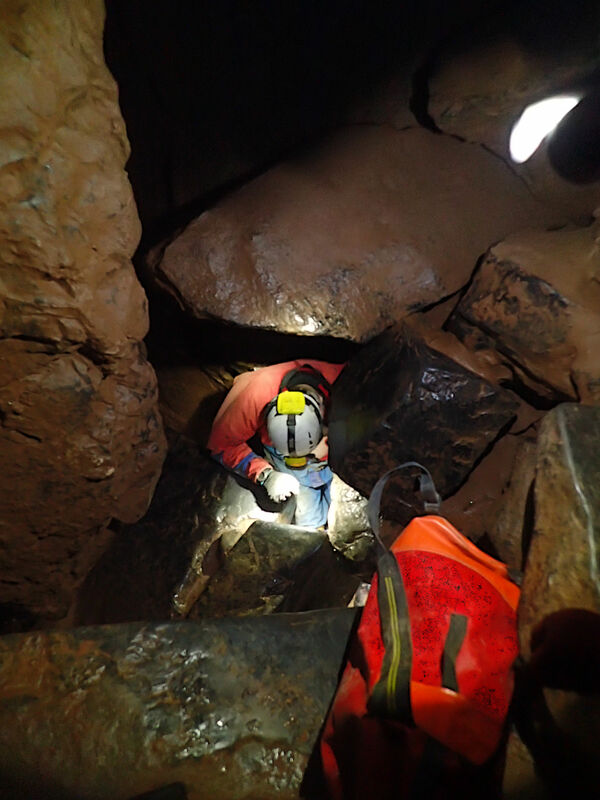 We were making good time down to the bottom of the pot, gravity is a wonderful thing! My favourite was the 35m 4th pitch, with a deviation part way down. It wasn’t far from my mind that for every metre we descended, we would have to climb back up. Gravity isn’t so wonderful after all. 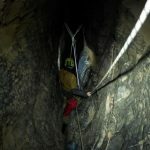 While descending the last pitch, the rope below me got tangled in the in-situ rope, blocking my safe descent. 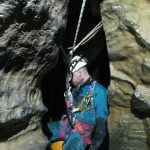 Locking off my descender, I was held on the rope, under the waterfall which was apparently carrying more flow than normal. 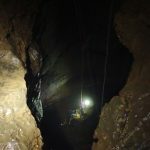 All while my caving chums were 15m below me, leisurely taking photos of my descent. No matter how loud I shouted, they couldn’t hear me over the roar of the waterfall. Eventually they heard my pleas and untangled the ropes to allow my final descent. By the time I got off the rope, and regained my sense of humour, I was soaked through to the skin. 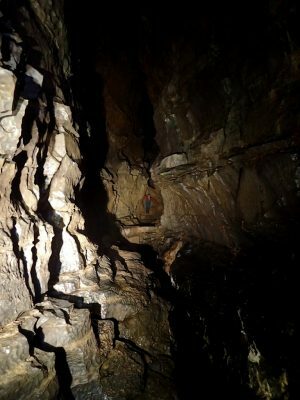 From the base of the fifth pitch, it is a long walk to the final sump, all of about 5m. Some serious effort has gone into making the sump a diver’s paradise, which has apparently been dye traced to the washing machine in DYO. A quick natter and some photos, we were off back up the pitches and out of the cave. Huw J led the way, then I followed, with Dave bringing up the rear. Many profanities and a vow to list my SRT on eBay as soon as I got home, we were nearing the top of the pot. On the second pitch I had just about got my prussiking technique efficient enough to not be aching all over by the time I got to the top of the pitch. The hardest part of the pot was still to come, the 3m climb out of the entrance over an awkward, greasy and polished slab. Using some moves that would make a contortionist jealous, along with an ample amount of profanities and I was back to the daylight. Followed soon after by Dave, accompanied with some more profanities and three bags of tackle. Finally, Huw soon joined us in the late afternoon haze. We were back to the cars and changed before we knew it. Ready to head our respective ways. That night, I was unable to sleep. My whole body was still throbbing from the exertion. 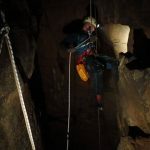 My mind was still racing with adrenaline, replaying every abseil, rebelay and deviation over and over all night. 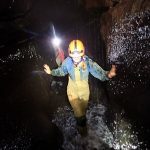 Wondering what to do, we decided to have a nice easy trip to Bridge Cave in the Nedd Fechan valley. 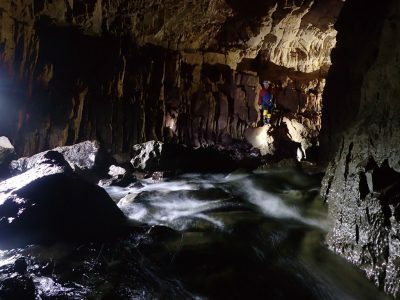 This cave is a nice easy trip, frequented by outdoor pursuits groups and consists of a short section of passages before reaching a short choke and then dropping into a stream passage that opens up into a large impressive passage where following the stream past another inlet, under the bridge that gives the cave its name and will then to the end of the cave and the sump that was the original way into Little Neath River Cave. 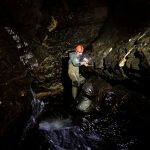 Despite apocryphal stories of scouts freediving this sump, the way on from here is only for the experienced cave divers. 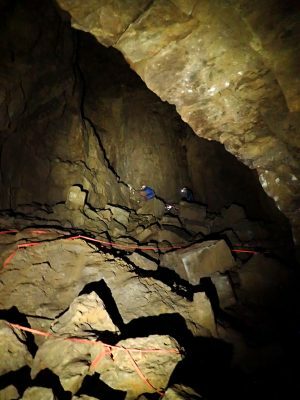 We passed the entrance series quickly and entered the main passage and then had a look around and continued on to the end of the cave. I then got out the camera and we set up and shot a few pictures on the way back upstream. 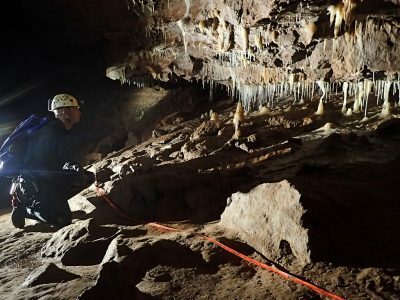 There’s a massive push to re-tape Draenen in the coming future and 17th Feb was set as date for another re-taping session, this time in the northern passage of the cave through Gilwern and into Forever Changed. 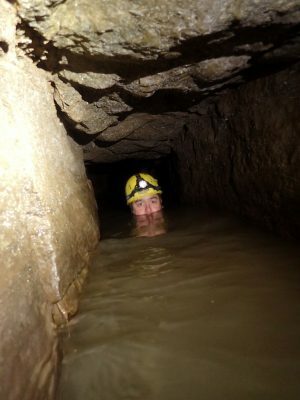 Tom was relieved, as at first thought of doing some conservation trips, he presumed he would be picking up the human poo he discovered down in Haggis Basher a few weeks previously and he had been fretting about which pooper scooper would be sufficient and strong enough to survive a trip in and out whilst scooping up the smelly mars bars. 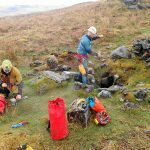 We all met up at Pwll Du and being a fairly mixed bunch; we introduced ourselves to new faces, got kitted up and packed meters plus meters of conservation tape with new pickets into our tackle sacks. 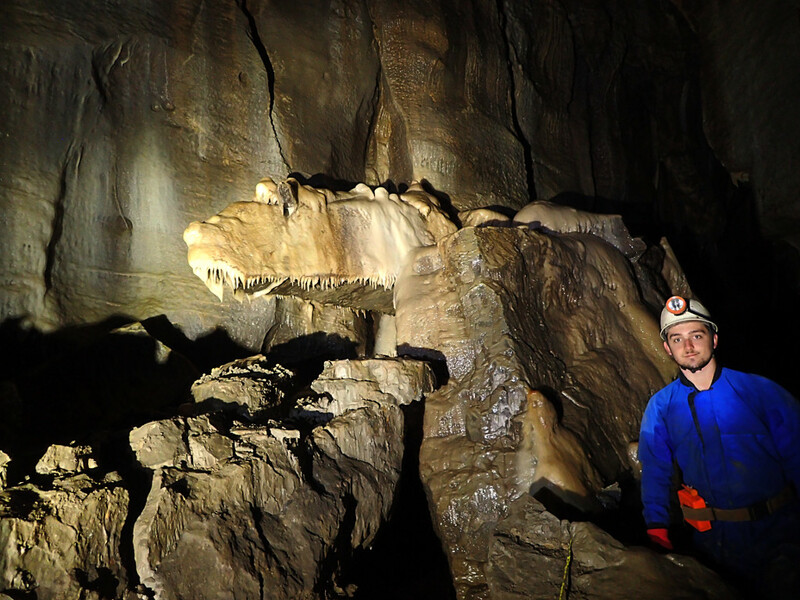 Making good time through the entrance series and into Gilwern we stopped at Giles Shirt to marvel at the formations. Whilst making our way through Gilwern Passage, Josh showed us the previous few trips’ efforts of re-taping. Reaching the choke into Forever Changed it was here that I discovered that I had probably enjoyed a bit too much steak in France a few weeks previously, as I found it to be tight! Once I had I popped out the other side like a popped champagne cork the taping was in full flow already. 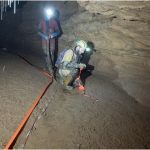 The emphasis was getting the mini stakes and pickets to raise the tape out of the mud and to bring the walkway in slightly, before more people accidentally stepped over, ruining pristine passage. There’s not much more to say on this subject apart from a lot of tape was nicely laid and old tape removed. I’d have to confirm with Josh how much we laid and length of passage covered but I do know we stopped short of the junction leading off to the duck so another trip is needed to finish that off. 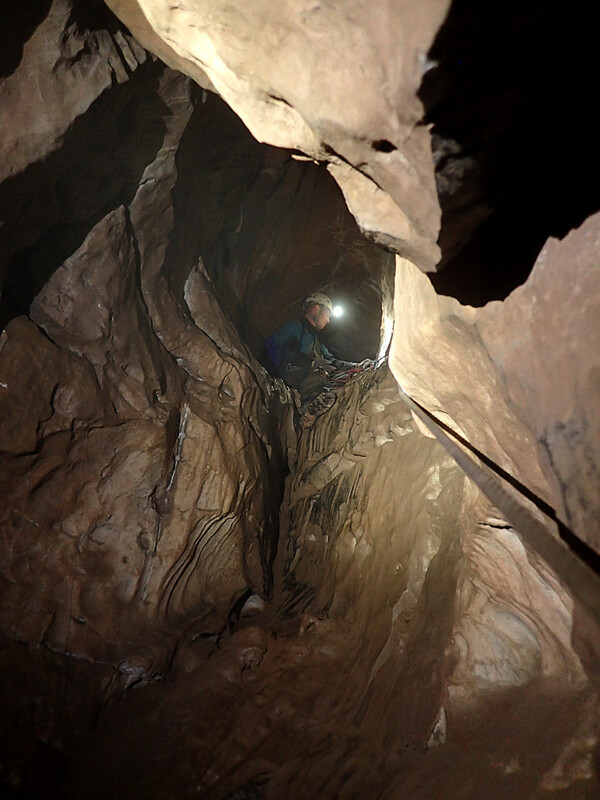 Once the tape had run out, an hour or so was spent exploring some of the northern passages in this part of the cave. 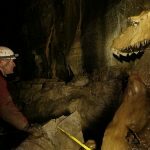 Possible conservation work was found and most importantly…possible leads? Who knows? On exit from Gilwern Passage an old camp was spotted just before Tea Junction, so it was decided to pack this away but nobody fancied trying the out of date pot noodle! Outside it was finally a little bit sunny and it wasn’t even raining! Very odd. Great to meet up with some other clubs to look after a special place. 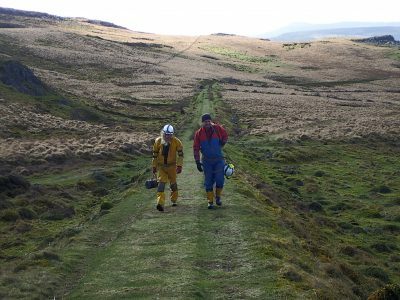 Adam and I decided that we needed to burn off some of the Christmas period’s bacchanalian excesses and headed into Craig a Ffynnon for a visit to North West Inlet. Adam picked me up and we hit our first obstacle, the A465 roadworks that caused a diversion to the bottom of The Rock and back up again where our next obstacle was encountered. The usual place where everyone parks these days was full of cars. We could just about fit in but a chap in a van told us that the layby was to be used for lorries turning around so we could get back to find the car gone. Down to the remains of the Rock and Fountain revealed a building site, but, we were still able to park. This turned out to be a good spot, the temperature was near zero with frost and could nip into the old pub to shelter from the keen wind to get changed. 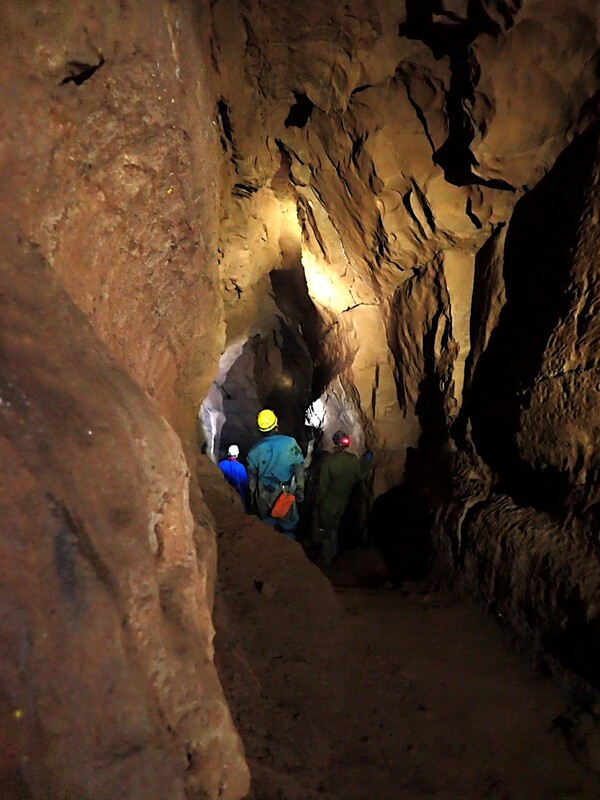 We were soon changed into our finest cordura and neoprene and heading up he road to the cave. a bit later than planned, but not too bad all things considered. ..and we were soon inside. We warmed up a bit but were soon confronted with the rather wet way into NWI. This proved to be far colder than usual and caused some language that you wouldn’t use in front of your mother-in-law. 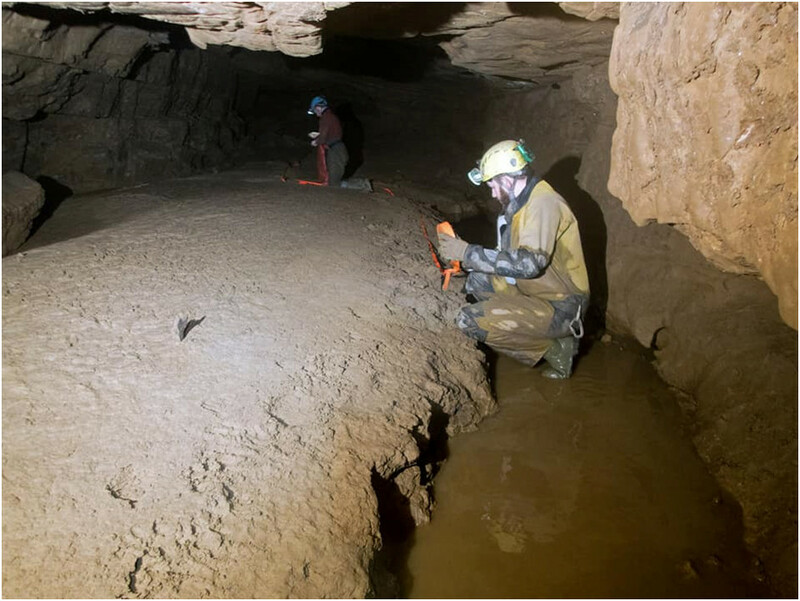 Things were getting numb and shriveled so we moved quickly, and Adam, who was on his first visit to NWI, was impressed as the passage roof lifted and the way on grew to impressive proportions with some very nice formations. 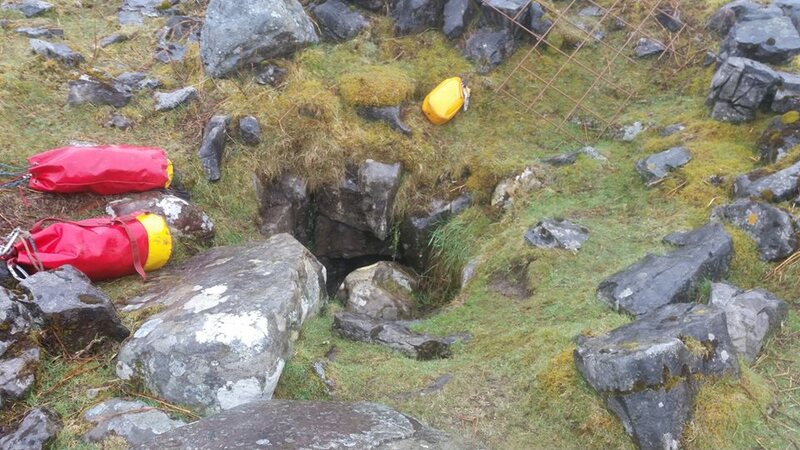 We were soon at the dig at the end of the passage for a mooch around the still in situ mini railway. A couple of photos were taken and then we headed back stopping for a few more photographs on the way. Fresh year and with fresh weight gained from turkey, beer and other festive goodies we decided a short trip in Aggy was in order to burn off a few calories on the walk to and from the cave itself. Plus Tom had a brand new yellow suit from St Nick’s sack to get dirty. 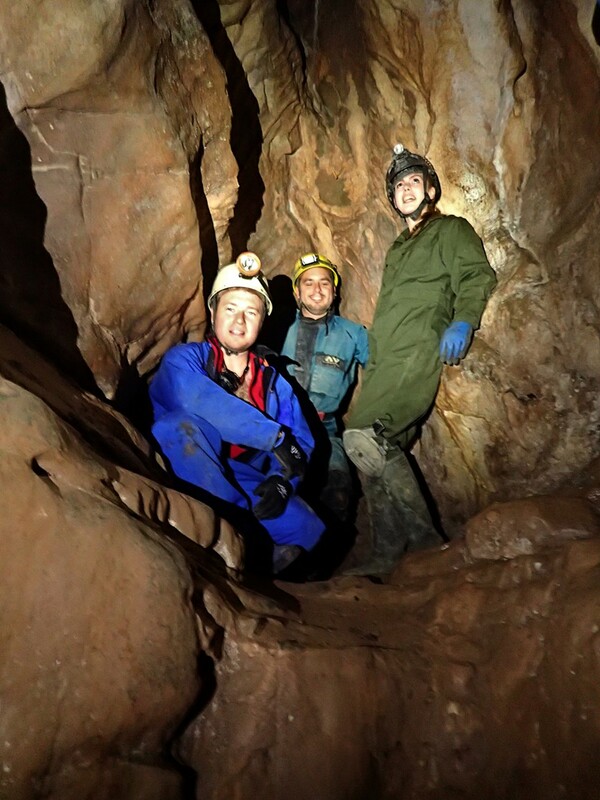 It was good to be back in Aggy after mine and Tom’s trip back in October when we did the Classic Inner circle trip. 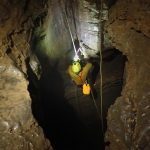 But this trip was one I’d wanted to do since 1998 which was the last time I had done it as a young gobby teenager refusing to get in the entrance when Richard had taken me for my first caving trip. Eventually he coaxed me in and the rest is history I suppose. Storm Eleanor was looming as we met at 3pm so a nice coffee and chat was enjoyed first in Richards van before we braved the elements to get kitted up. 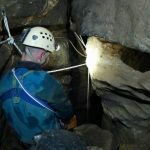 Heading off along the tram road, it was clear that being underground was going to be a welcome relief from the weather. Sliding through the gate and into the entrance series we went. Conversation was flowing as was the stream! 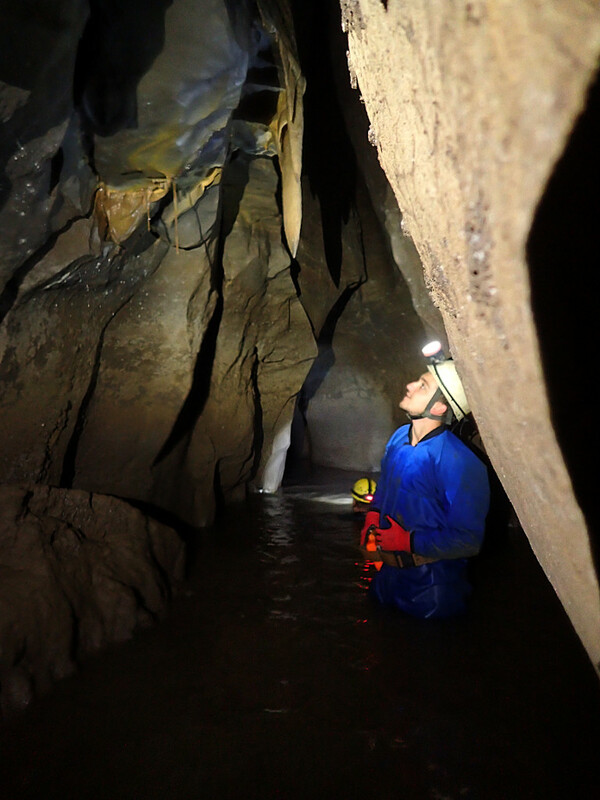 The water levels were certainly up as were the bat roosts. There was hundreds of them so we carefully picked our way through the series and poor Tom got a family lesson from us both for which I’m sure he’s thankful….. Heading off down Main Passage we could hear Main Stream passage thundering away in the distance as we passed the junction for it on the right, we headed off up to the left and entered Main Passage proper. This is the one part of the cave I always remembered from when I was a kid. The hard glacial deposited mud with its perfect cracks, I would have loved to been the first to stomp down there when it was pristine. 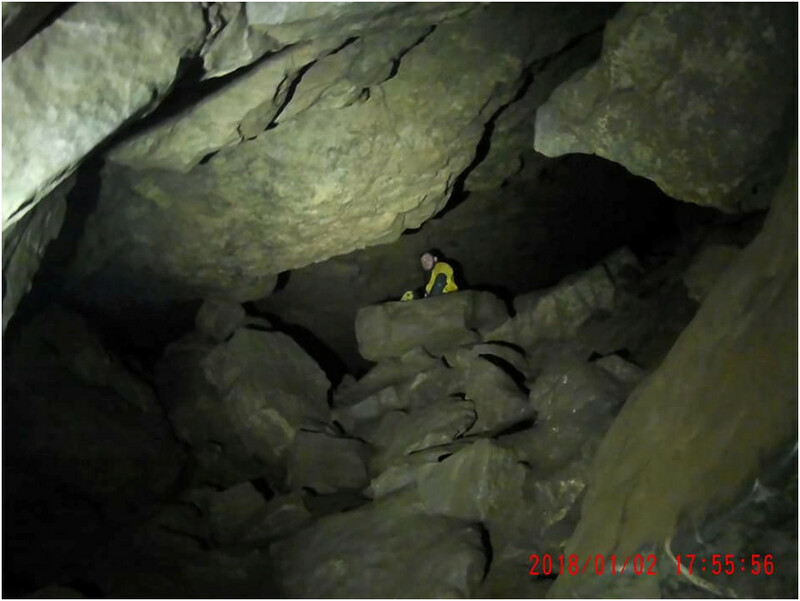 More bats were found but hanging in some strange places, like very close to the floor on boulders? Scared of the higher roosts maybe. Reaching Music Hall we admired the newer music stand which had been dragged in a few years ago and headed off to the Cliffs Of Dover to have poke around. 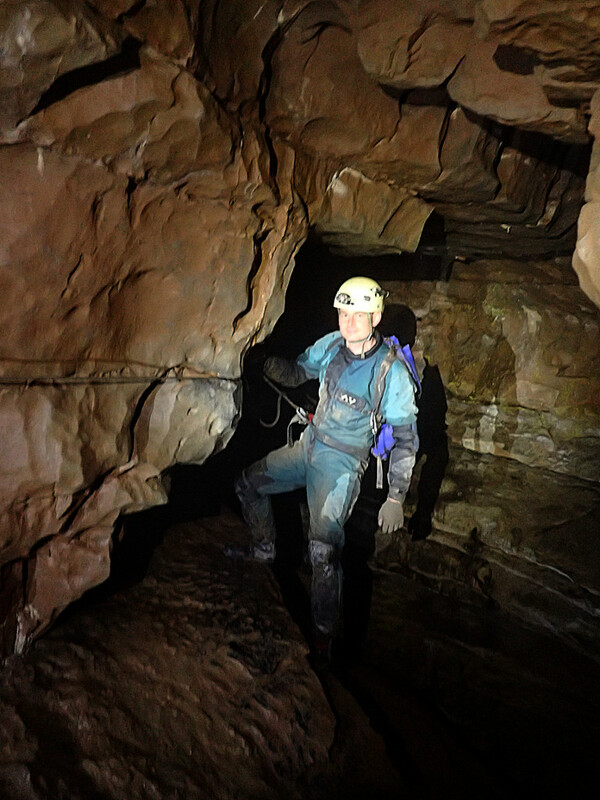 We exited the cave to heavy heavy rain but I suppose that’s the kit cleaned down ready for the next trip!